At DSM, we pride ourselves on our bespoke service. This is especially evident in our extractor canopies, where our many years of experience go into creating the exact canopy needed for each client, and for each field. Whether you are looking for an extractor hood for a chemical laboratory, or need a tailor-made set of canopies for a catering environment, we can provide the product you require, to your exact measurements and specifications. 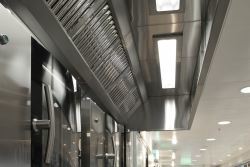 We use the highest-quality, ‘304’ food-grade stainless steel, so not only are our canopies aesthetically pleasing – with a stylish, gleaming surface – but they are also easy to maintain and naturally antibacterial, conforming to current Health & Safety and Food Hygiene regulations. What’s more, they are extremely durable, lasting for many years. 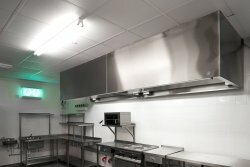 Our sturdy extractor hoods will remove grease, fumes, smoke and odour from the air, creating a safer, more pleasant working environment for your staff. They will also help to prevent food smells from reaching restaurant clientele, or chemical odours from seeping out of laboratories and reaching other rooms in the building. The interior of each hood features fully washable steel baffle filters and removable grease collection cups, so you can be sure of maintaining a consistently efficient level of extraction throughout the canopy’s long life. Our expertise in the field is demonstrated by our many prestigious clients – including Sainsbury’s, where our unique designs can be seen in the supermarket chain’s restaurant kitchens, bakeries and ‘food-to-go’ serveries. Laboratory requirements are different from those of any other field. With corrosive fumes, gases and moisture to contend with, your staff need a high-quality, reliable extractor canopy, to ensure their health and safety. Our stainless-steel canopies are the answer. Made from laboratory-specification, 316-grade steel throughout, they will last for many years in even the busiest of laboratories. Low-maintenance and easy to clean, they make a gleaming, attractive addition to any hi-tech lab environment. Each of our canopies is bespoke, meaning we can fabricate the exact hood you require for your work space, to your own design, measurements and specifications. We fabricate an entire range of products for the laboratory. Take a look at our selection of sinks, worktops, splashbacks, frames, tables, trolleys, fume cupboard liners, radiation sinks and shower trays, all of which are fully bespoke, so you can obtain the exact items you need for your specific working environment. 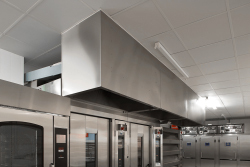 Whether you are furnishing a nursery, a school food technology room or a university kitchen, you need hardworking extractor canopies you can rely on. We appreciate the very specific needs of an educational environment, where cooker hoods may need to be unobtrusive, to take up as little room as possible, and to run quietly, so that the instructor’s voice can be heard. Because all of our products are bespoke, we can work with you, to fabricate the exact canopies you need for your project. Our extractor hoods are made from 304 food-grade steel, which conforms to all current Health & Safety and Food Hygiene regulations. 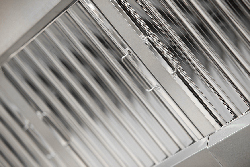 Internally, the steel baffle filters are fully washable and the grease collection cups are removable for cleaning. Our canopies are also a wise choice financially, as our steel is so durable, it will last for many years. Take a look at our other hardwearing products, from sinks, wash troughs, worktops and splashbacks to cupboards, tables, trolleys and shower trays. 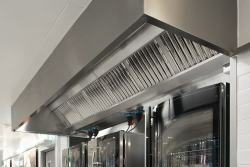 Every kitchen needs an extractor hood, to remove grease and reduce odour build-up. 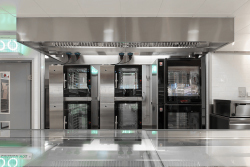 At DSM, we have many years’ experience of supplying steel products to the catering industry, so we have an in-depth understanding of the requirements of a busy commercial kitchen. Our bespoke production base enables us to work to your designs, measurements and specifications, to fabricate the product you need. We can work with contractors and end users, as well as with fitters seeking to produce own-brand products. Whatever your requirements, we can fabricate the canopy to fit. We are known for the quality and durability of our products. 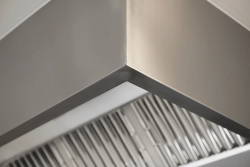 All of our extractor hoods are made from 304 food-grade steel – which conforms to current Health & Safety and Food Hygiene regulations – and come complete with washable steel baffle filters and removable grease collection cups as standard. With very little maintenance, your canopies will last for many years. Our expertise extends far beyond canopies: take a look at our other products, including cupboards, frames, sinks, shower trays, preparation tables, shelves, splashbacks, trolleys and wash troughs. We can create entire kitchens to your specifications – and our products will outlast other materials, making them fantastic value for money.